It was a beautiful start to a normal Tuesday for the Pentagon Force Protection Agency’s then-Officer Isaac Ho’opi’i and his K9 partner, Vito. At 9:36 a.m., the pair was at the Fort Myer veterinary clinic in Virginia for Vito’s basic checkup. A minute later, their skill and mettle would be tested as the call came over Ho’opi’i’s radio. The pair rushed back to the Pentagon, lights flashing and sirens wailing, to find a building—their building, with their people inside—burning and severely damaged by the impact of American Airlines Flight 77. “Because of the flames and smoke, I couldn’t see anything,” now-Sergeant Ho’opi’i said. “All I could hear was crying voices calling out for help. Then, someone appeared out of the smoke. Ho’opi’i put them on his shoulder and carried them to safety. He did this again and again. “I couldn’t tell if they were male or female,” he said. “Most of them were badly burned. Even when the worst was over, Ho’opi’i and Vito weren’t finished. They continued working through the night to secure the Pentagon against another attack, sniffing for explosives. For the next 11 months, they checked deliveries and vehicles at checkpoints 12 to 16 hours a day. Upon retirement, he’d been adopted by the Ho’opi’i family. 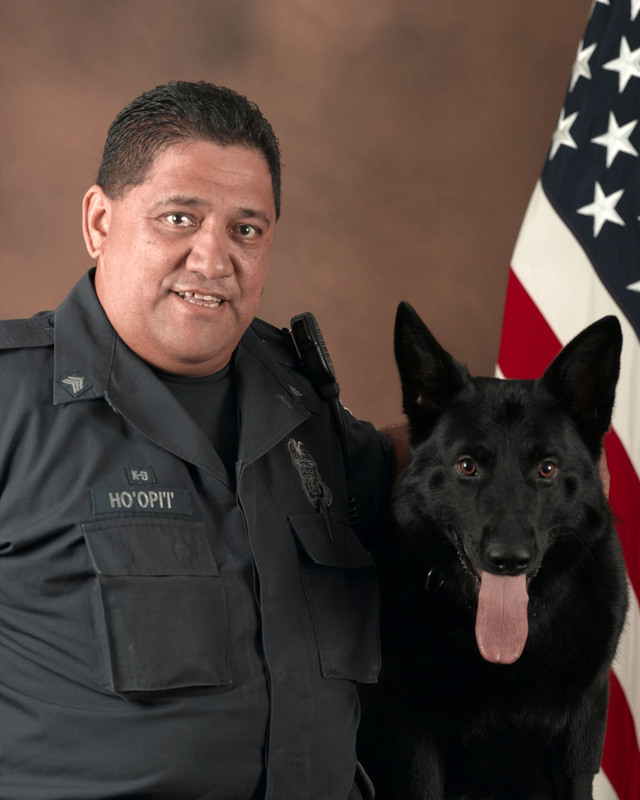 The K9 partner that had served Ho’opi’i and the Pentagon well, passed away in his sleep at age 4. But Marco, an energetic dog with a deep drive to work, was right there to step in and take over where Vito left off. He, too, has passed on. The hours, days and months took their toll on Ho’opi’i, making him question whether he’d done enough to help those trapped in the destruction on 9/11. They also nudged realizations to the surface, things we inherently know, but tend to forget as we go about our daily lives. Ho’opi’i’s tremendous effort and sacrifice on 9/11 and the following months didn’t go unnoticed. The Honolulu Advertiser recognized the Waianae, Oahu, native in more than one article. So did other news organizations across the country. More importantly, his country recognized his contributions by awarding him the 9/11 Heroes Medal of Valor. While Ho’opi’i said he was deeply humbled and honored to receive the medal, he also said it was those who’d lost loved ones in the attack that really deserved it.